English Heritage have announced that access into the inner circle of Stonehenge is to be restricted and future visitors must wear hard hats at all time. Is Stonehenge safe to walk around ? It’s not surprising when many thousand year old megalithic structures without deep roots and only minimally interlocking joints eventually fall over as they are undermined. There definitely has been ground erosion. IIRC, the stones are gently sinking into the soil, year by year. There’s also a major road nearby which is causing both vibration and air pollution problems. The stones have also had acid rain erosion problems. Parts of Stonehenge certainly have fallen over in the past. Stone 22 and a lintel – both in the outer circle – fell on 31st December 1900. In the central horseshoe of 5 trilithon pairs, 57-58 and their lintel fell over in 1797, but were restored in 1958. Stone 23 keeled over in 1963, which is the last major collapse. High Visibility Jackets is not enough. Security guards already wear high visibility jackets, however this does not provide adequate protection and the contractors are currenty at risk. Staff and visitors would be exposed to objects falling from a height. This announcement will effect the Summer Solstice celebrations and future ‘open access’ visits. This has angered local pagan communities. 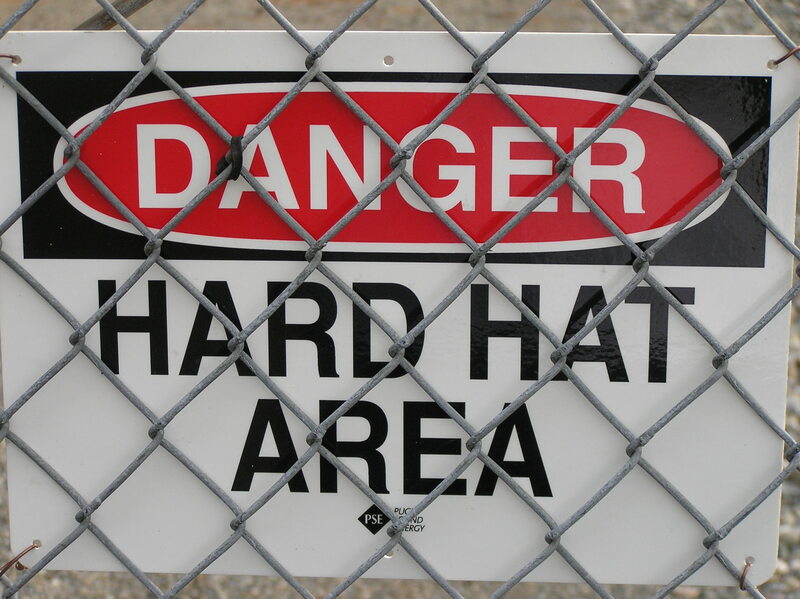 English Heritage will not be supplying hard hats ‘free of charge’ and will not allow entry without them. 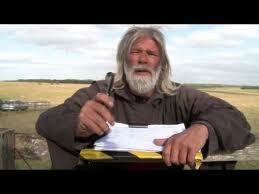 Local Druid Arthur was outraged to hear the news and is convinced this is just a ploy by English Heritage and Wiltshire Police to prevent future ‘open access’ to the monument. Space – Dismissed in 1959 by the USSR Luna 3 probe as a pile of inconsequential volcanic trash a 3,000ft diameter standing stone formation has been captured on camera by NASA’s latest mission. Stunning pictures from the Grail-A spacecraft reveal a giant lunar Stonehenge close to the Mare Ingenii – or Sea of Ingenuity – impact crater. NASA HQ astrophysicists said today they’d long suspected the existence of a Stonehenge-like structure on the Moon’s far side after decades of studying decrypted ancient Egyptian creation texts. An Agency press release confirmed the Grail-A’s high definition close-ups depict some mysterious hieroglyphs hewn into the monoliths. The news may also cause blood to boil at the European Space Agency where the possibility that Stonehenge’s Wiltshire site was chosen ‘by a vastly superior intelligence’ to copy the lunar edifice would place the UK at the heart of the current human civilization. Belgian nationalism has always maintained the center of the Universe is located in Brussels, home of the Euro and of the moules-frites gastronomic delicacy (sick). That gung-ho spin now faces oblivion as NASA pictures emerge from the shadows, echoing a June 2009 report claiming crumbling remains of the former palatial Atlantis fortress were filmed by International Space Station cameras focused on the Moon’s dark side. Confirmation of the lunar Stonehenge creation could be the first step to unravelling the astrophysics of ‘As Above, So Below’ ancient pagan lore, the NASA source added. Later today NASA’s Grail-B twin craft will track its companion’s lunar orbit and carry out its own 3D surveillance. The Prime Minister and the US President have asked to be kept informed. ALLIANCE, Neb. 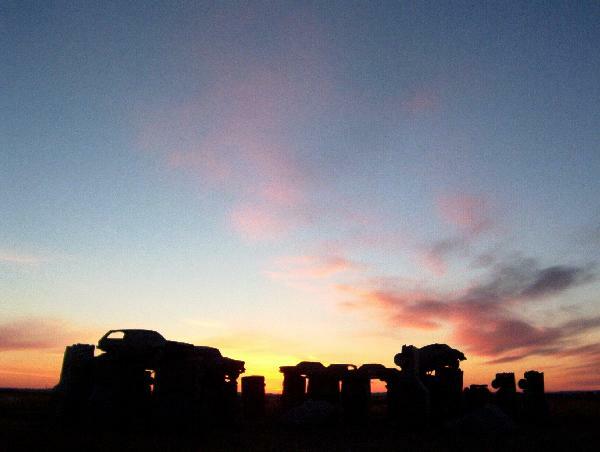 — Nebraska’s Carhenge, an automobile replica of England’s Stonehenge, the prehistoric circle of stones, is up for sale. The asking price is $300,000. Alliance radio station KCOW (http://bit.ly/nG8z08 ) says Wednesday that the Friends of Carhenge board of directors voted to place the 24-year-old tourist attraction, which consists of a circle of 38 cars, on the market. The organization’s president, Marcia Buck, says the quirky tourist attraction lacked volunteers and limited capital. Carhenge was built in 1987 by the Jim Reinders family on land that Reinders’ family once farmed just north of Alliance in western Nebraska. Reinders donated Carhenge and 10 acres of land around it to the Friends organization a few years later. ‘Standing Stones’ at Famous Wiltshire Site to be moved to London! Following discussions with the government the famous ancient standing stones of Wiltshire’s ‘Stonehenge‘ are not going to have to be destroyed after all. Instead they are to be carefully taken down from there present site at Amesbury then relocated to a new permanent site on East London’s Hackney Marshes. The idea is to have the job completed in time for the start of next summer’s Olympic Games. 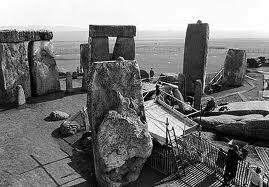 Wiltshire’s councillors took the decision to order the removal of the large circle of standing stones from the hill at Amesbury after a sharp eyed official at their offices in Salisbury discovered they had no records to show planning permission had ever been granted for there erection. 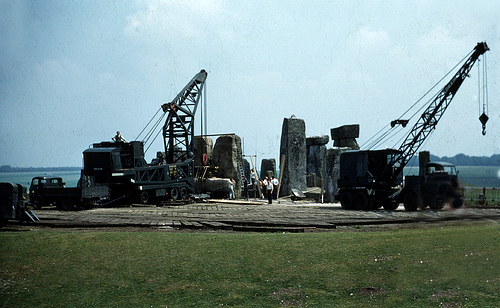 The original purpose of erecting the stones is uncertain, though it is now thought most likely that they were intended just as the first few stones of what would then go on to become a giant pyramid, though Wiltshire council admit there is no evidence to show the construction was then abandoned when planning permission was turned down. The first of the smaller standing stones was in the process of being removed from the hill near Salisbury this morning. It is expected to be standing on it’s new site on Hackney Marshes as early as tomorrow evening (Sunday). It should be clearly visible to people heading into work on Monday morning from the Essex side of London, and clearly visible to them from the flyover just after and on the opposite side from where the old Hackney greyhound stadium, now part of the Olympic Park, used to be. Once all the old Stonehenge standing stones have been removed from the Wiltshire site the plan is to build a much needed new supermarket on the old Stonehenge hill. 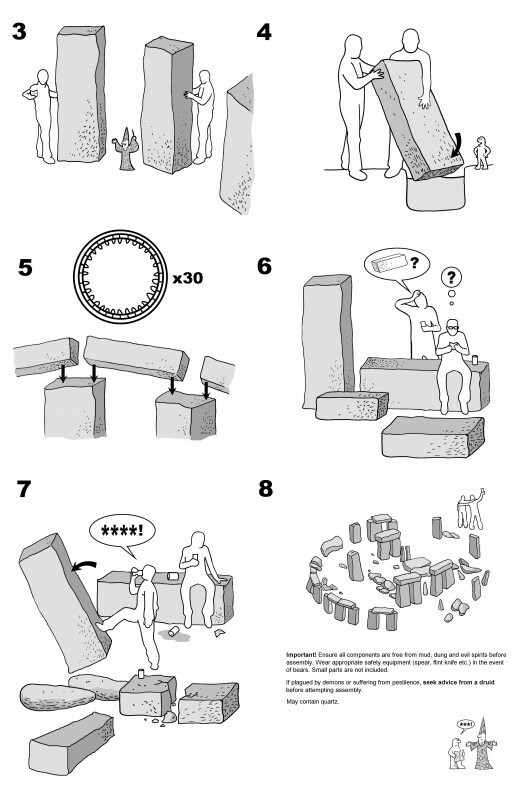 Ikea Stonehenge (HENJ) DIY flat-pack henge. Crowds of people gathering to celebrate the modern day summer solstice at Stonehenge has developed from a grass-roots level and this is something we are not used to in our fast-paced consumer driven society. The notion of people gathering together under their own terms is in some ways a lost art in Britain outside the confines of major sporting occasions, concerts, weekend shopping trips and nights out on the town. Major royal and civic events could also be added to this list. The festival scene however, has given more alternative gathering a real boost. The nature of celebration is to have a joyous time and it is interesting to note that the United Kingdom has amongst the least number of public holidays in Europe. We work increasingly long hours and stresses of modern living can take a toll on the body, as well as the mind. There is certainly a market for a successful summer solstice celebration at Stonehenge for people intending to free their spirits in a communal gathering at an age-old and identifiable site. So, who actually attends the modern celebrations? The answer is many different groups of people – Druids, pagans, wiccans, witches, tourists, locals, revellers, hippies, night-clubbers, bikers, students, curious on-lookers, spiritualists, historians, political activists, anarchists, eccentrics, environmentalists, travellers and astronomers. Some adherents to eastern religions such as Hare Krishna devotees and some practitioners of Buddhist meditation may also attend, as well as many people from abroad. The fact is, that this is now an occasion open to anyone who wants to come; gone are the days of exclusion. The first sizeable groups to visit the stones in modern times, other than passing travellers and nearby townsfolk were 19th century day trippers; often using the railway to Salisbury as a connecting point. At the turn of the 20th century ownership was transferred from private hands to the nation. 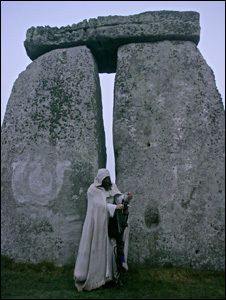 Modern day Druids started to hold ceremonies with groups of onlookers. This soon developed into a larger gathering or open fair by the 1920’s, with music and crowds ranging from a few hundred to a few thousand. Later by the 1960’s the site became a focus for counter-culture and a large annual ‘free festival’ started to emerge from 1974 onwards. Several leading figures including Phil Russell, alias ‘Wally Hope’ dedicated the stones as a people’s temple open to all and the developing free festival became the embodiment of these ideals. In 1985 the growing festival and its associated peace convoy of travellers was brutally ambushed by the police in the infamous ‘Battle of the Beanfield’. In this year the festival was smashed before it even began. An antagonistic exclusion zone was then set up around the stones for what eventually amounted to the next fourteen years. People however, still yearned to gather at this special place and after several years of negotiation, arrangements were finally granted for a few hours of access at midsummer 2000. The issue of the festival is still a contentious issue. 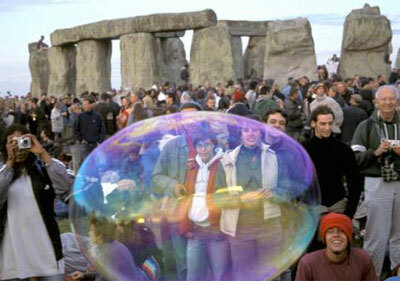 There are those who argue for the right to gather at the stones for a few days and party. The National Trust, who are the major landowners around the site, the police, local residents and English Heritage all continue to express the concern that the original free festival was unsustainable. It had grown out of all proportion to the site and threatened the surrounding landscape. They believe the same would happen again if another free festival emerged and that the best way forward is through the structure of Managed Open Access (MOA). However, there continues to be an open debate about what the nature of the occasion is all about. Crowd numbers are another major factor concerning the modern celebrations. This happened in 2003 when the MOA fell on a weekend for the first time and 30,000 people turned up. The management of such large numbers is a real concern for English Heritage. It is possible that attendance might increase again, but since the high point of 2003 numbers have generally levelled out at about 21,000. This proves that the appeal of the gathering does indeed have its limitations, especially when other factors such as the weather, a midweek solstice and even *England international football matches are taken into consideration. Entering the solstice space of MOA the central horseshoe of the main circle is filled to capacity with revellers cheering to an undulating beat of drums. The majority of the crowd, however, sit and stand outside waiting for the sun to arrive under the ambient glow of mobile flood light units. A simple sheet of rules known as the ‘Terms and Conditions of Entry’ is provided to all attendees. Apart from the time of sunrise and the preceding sunset, there is a distinct lack of information about the main torch-lit parade and Druid ceremony. Yet, even with this lack of knowledge about things to do, the celebrations are a major draw. The lack of any structure is there to allow the occasion to develop from the ground up rather than be imposed from the top down. Revelry and drunkenness is a common feature of the solstice and many do go there to get high. However, if the event is to move forward the provision of more information with the emphasis on the positive would be a good idea. For most, having a drink at the solstice is no more than a social lubricant, but unfortunately for a small minority the drunkenness can take on a slightly anti-social element with sometimes misplaced exuberance around others, especially those with young children. Whilst drunkenness will always be a feature of the summer solstice celebrations, the anti-social aspect to the revelry can often be quite shocking for those expecting a more sedate occasion and whilst Stonehenge can enthral an audience, it can also greatly disappoint. The lack of respect for the site created by the debris of the all-night party scene has led some people to ask themselves the question – would they really want to go again? The very nature of Stonehenge is that it is all things to all people and thankfully, there are many who do treat the site with respect, and take a positive view of the place. A small band of volunteer ‘Peace Stewards’ help with general advice and aim to defuse tensions with the unruly few. Personally, I am attracted to the solstice because it represents a free-space where ideas can germinate. It is a place where a connection can be made with a primeval urge to follow in the footsteps of the ancestors and mark out a sustainable path for the future. Without the vision of the original festival organisers and the campaign for access after the Beanfield none of this would have happened. This included those who kept turning up at the stones attempting to celebrate the solstice during the years of exclusion. Perhaps the emphasis on excessive hedonism is a continuing part of an ancient tradition and a ritual for some in its own right? The recent discovery and excavation of the temple’s original associated village at the nearby Durrington Walls confirmed that the place also had associations of being where people ‘went to party’ (3) in the distant past, albeit with reference to the winter solstice, rather than the summer one. In reality drunkenness at the stones today only mirrors issues of ‘binge-drinking’ in wider British society. What you see at the summer solstice celebrations is no different to what goes on during most weekends in any major UK town or city centre. Public safety however, is paramount in the minds of the authorities and memories of the football disasters of the 1980’s combined with the current climate for ‘compensation culture’ has lead to a cautious approach. Local authorities and governmental agencies tend to like events which they conceive and manage themselves, rather than ones which grow out of the public imagination, which they then have to manage afterwards. 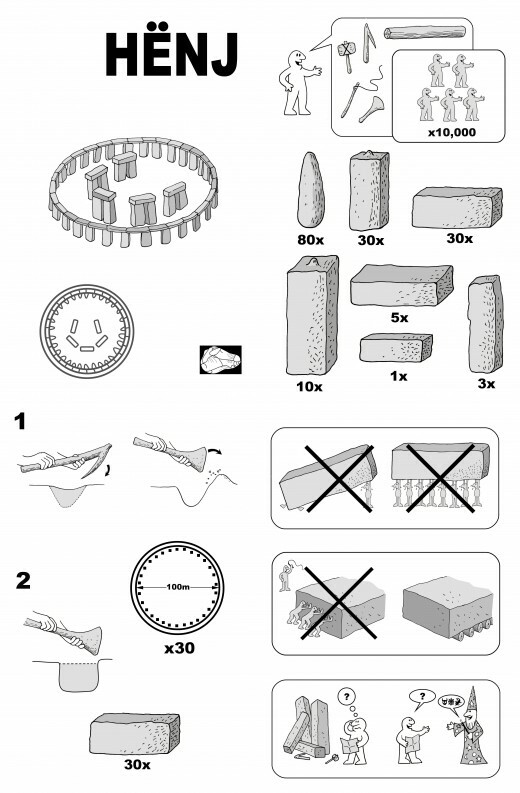 The current MOA arrangement at Stonehenge is just this type of situation and is a good example of one big compromise between a whole-range of interested parties. Anyone who has followed the story of solstice access over the last few years will have no doubt realised that excluding people just does not work. Stonehenge is a temple open to everyone. Everyone, really meaning everyone and the saying, ‘bring what you expect to find’ could not be truer. *The Football World Cup and European Championships finals are often held in June and key matches can coincide with the celebrations. This is of course dependant on England qualifying!